As you've already learned, objects define their interaction with the outside world through the methods that they expose. Methods form the object's interface with the outside world; the buttons on the front of your television set, for example, are the interface between you and the electrical wiring on the other side of its plastic casing. You press the "power" button to turn the television on and off. // methods are missing from this class. Implementing an interface allows a class to become more formal about the behavior it promises to provide. Interfaces form a contract between the class and the outside world, and this contract is enforced at build time by the compiler. If your class claims to implement an interface, all methods defined by that interface must appear in its source code before the class will successfully compile. The interface determines the requests that you can make for a particular object. However, there must be code somewhere to satisfy that request. This, along with the hidden data, comprises the implementation. From a procedural programming standpoint, it’s not that complicated. A type has a method associated with each possible request, and when you make a particular request to an object, that method is called. This process is usually summarized by saying that you “send a message” (make a request) to an object, and the object figures out what to do with that message (it executes code). Here, the name of the type/class is Light, the name of this particular Light object is lt, and the requests that you can make of a Light object are to turn it on, turn it off, make it brighter, or make it dimmer. You create a Light object by defining a “reference” (lt) for that object and calling new to request a new object of that type. To send a message to the object, you state the name of the object and connect it to the message request with a period (dot). From the standpoint of the user of a predefined class, that’s pretty much all there is to programming with objects. The preceding diagram follows the format of the Unified Modeling Language (UML). Each class is represented by a box, with the type name in the top portion of the box, any data members that you care to describe in the middle portion of the box, and the methods (the functions that belong to this object, which receive any messages you send to that object) in the bottom portion of the box. 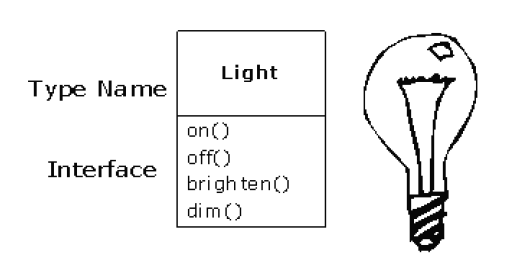 Often, only the name of the class and the public methods are shown in UML design diagrams, so the middle portion is not shown, as in this case. If you’re only in the class name, then the bottom portion doesn’t need to be shown, either.